The Tre Forze ESE pods house an exceptional gourmet espresso. The Arabic beans and robust beans are gently roasted over olive wood, the result is a distinctive aroma. Typical South Italian - Strong Espresso! Raw coffee grown on family-run farms in the best cultivation areas in Peru, Costa Rica, Togo, Kamerun and Brasilien, make it possible that the highest quality beans that money can buy can be used. 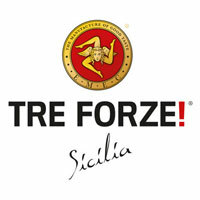 The TRE FORZE! Espresso cafe is roasted slowly in small lots (sack containing 60 Kilos per sack) over an open fire fed with wood taken from Sicilian olive trees. This olive wood is stored in a dry place for at least 12 months and comes from the olive tree groves that are to be found in the area around the Mount Etna volcano. The TRE FORZE! Espresso café is, thanks to the unusual manner in which it is roasted, significantly creamier and thicker and also contains less caffeine. With TRE FORZE! anybody using any machine can make a first-class cup of Espresso. In terms of optical effect, taste and content this Espresso café represents the zenith of Espresso culture. (Tre Forze Website) TreFroze! contains less caffeine, tannin and bitterer than many other espresso varieties. Incompatible acids are converted to compatible in the roasting process. The preservation of the stomach is guaranteed and you can also drink one cup more. 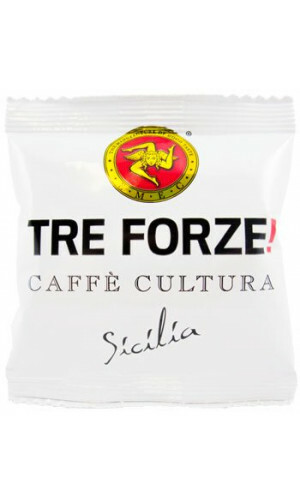 Try those strong ese espresso pods from Tre Forze today!